Kay Cake Beauty: Beauty Empties #13 ♡ ft. MAC, Guerlain, Charlotte Tilbury, ColourPop, Etude House, Skin79 + More! 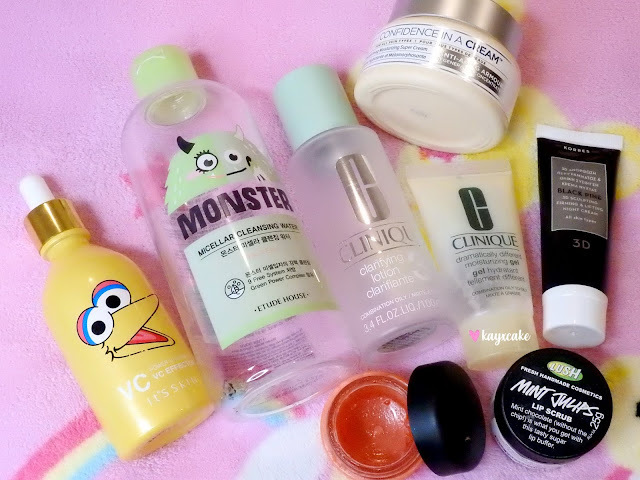 Beauty Empties #13 ♡ ft. MAC, Guerlain, Charlotte Tilbury, ColourPop, Etude House, Skin79 + More! Hi everyone, it's been awhile since I posted on this blog and no, I have not gave up blogging, I just felt like I needed a little break because blogging was costing too much and it is time consuming. Sometimes I felt like I have to rush through a post and it ends up being not perfect and I often ask myself what is the point of this blog when reviews aren't properly reviewed. Anyway, during my break I took some inspiration of project pans from Weibo (the Chinese twitter). When I say blogging is costing too much, what I mean by that is, to maintain an active beauty blog, I had to buy all these newly released makeup to keep up with the trends and I would end up with draws and draws of makeup that I probably only tried once and will never use again. 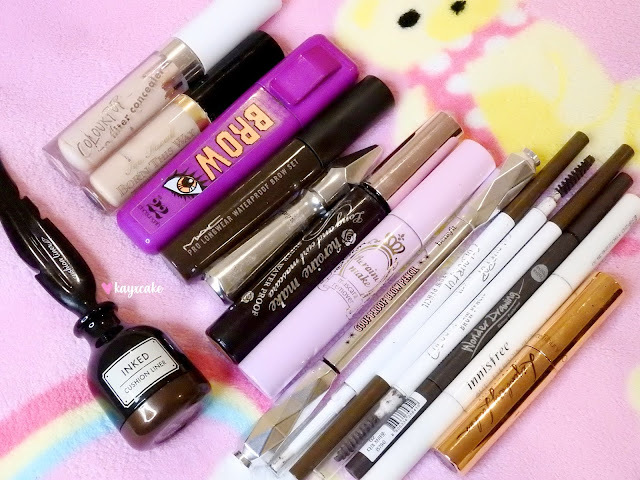 I used to be a makeup hoarder, I love buying makeup and I especially love collecting limited edition products. I know that it's wasting money and products, but I just could not help it. Then one day I was re-organizing my makeup collection when I thought... I am actually really sick of this, all these brand new makeup, all these money spent that I could actually buy food instead and seriously, when and where will I wear this blue lipstick?! It's thoughts like this that hits me hard and that is when my first project pan list really started. Nowadays I still buy makeup, but it's not as crazy as before and good news is, my project pan list is actually doing really well. Today I am sharing with you my latest Beauty Empties and if you are curious about the products I have hit pans on, head over to my Instagram as I post them to my IG stories. GUERLAIN Meteorites Perles Light-Diffusing Perfecting Primer was actually mentioned in my 11th Beauty Empties post and I am talking about it again as they were still a little bit of product left. I think Guerlain may have changed the name and packaging of this primer and it's now called the Meteorites Primer Perfecting Pearls. I wasn't a fan of this primer at first and I bought it because of the packaging, but after using it for awhile, I kind of fell in love with it. The texture is very lightweight, it squirts out like a gel formula and when spreads out it's kind of like water, it makes my face feels very smooth and I love that Guerlain fragrance, it's floral-ish and not over powering. GUERLAIN L'Or Radiance Primer is infused with pure gold flakes and the bottle looks so pretty. The primer itself is as amazing, although the texture is not as smooth as the one mentioned above, it does squirts out with the gold flakes and they disappear as you spread out the product. This primer is actually meant for people with normal to dry skin, it doesn't make my oily face more oily during the day, it smooth my skin, keeps my makeup in place and delivers that natural glow. WET N WILD Coverall Primer is life. The texture is a little thicker and when I spread out the product, it becomes a little sticky, after letting it dry for a minute, my face feels very soft and smooth. It cover pores, prevents concealer creasing and foundation caking and it really helps my makeup stays on all day. Surprisingly, hardly any crazy oily T-zone when wearing this primer. The only negative thing about this primer is the smell, it's not too bad, but as weird as it sounds, it smells like public swimming pools. CANDYDOLL BB Cream is a very old product and I am glad to have finally finished this. I only started liking this BB Cream towards the end, occasionally it would make my face looks flawless and other times I feel like it's just another BB Cream. ETUDE HOUSE Beauty Shot Face Blur is a re-purchase. I used to love this product, it brightens up my complexion, smooth out my skin and I can wear this without foundation on day that I don't feel like makeup. It smells like sunscreen, the texture is thick, but it's easily spread out using fingers. SKIN79 Pink BB Plumping Cushion is one of the best-selling BB Cream from the brand, this is the cushion version and the original one is the Super Plus BB Triple Function Hot Pink. 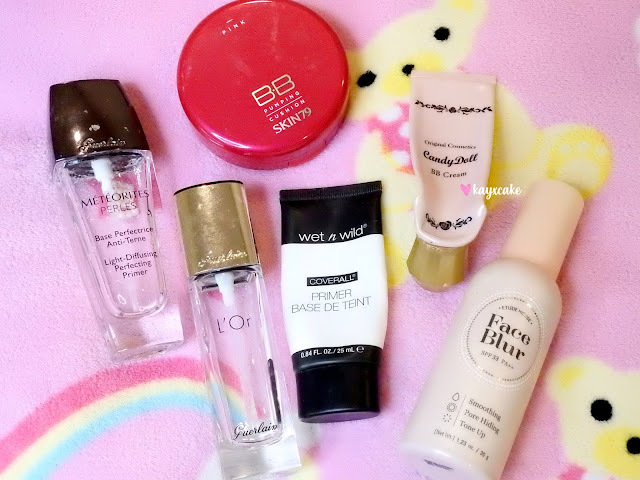 Back in the days when the blogging world has just started, everyone was obsessed with SKIN79's BB Creams, I have tried a few myself but they didn't work well with my skin. With the Cushion version, I like that it has a good coverage and it gives my face that natural healthy look. The packaging is a lot different to the traditional Korean BB Cushions and I find it hard to press and get the product out. When I apply it with the cushion pad it comes with, it looks like I have a lot of makeup on, but when I use a Beauty Blender, it gives me a very natural look. 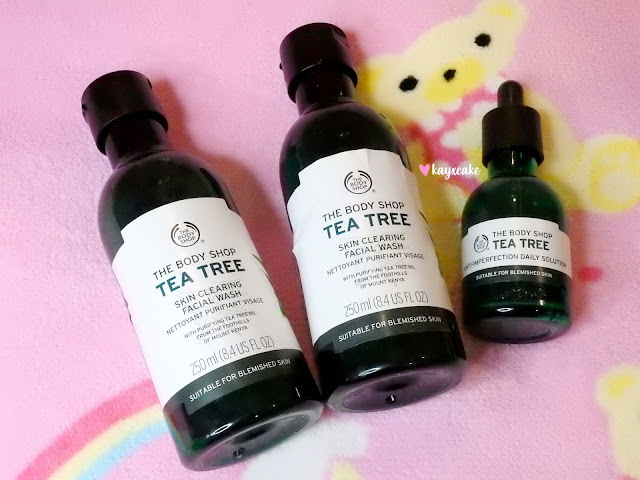 THE BODY SHOP Tea Tree Skin Clearing Facial Wash is probably the most mentioned emptied products on my blog, therefore, I don't think I need to explain this further. THE BODY SHOP Tea Tree Anti-Imperfection Daily Solution is also another stable products in my collection, ever since I bought my first bottle in Europe, I have been re-purchasing it every time I run out. It's Skin collaborated with Sesame Street and one of the most popular product from this collection is the Power 10 Formula, a range of 10 different serum targeting different skin concern. When I bought the IT'S SKIN x Sesame Street VC Power 10 Serum, I have absolutely no idea what it is, the girl from the makeup store told me it's a serum, you apply it before moisturising your face and you apply it before makeup and so I applied it as I was told. At first I didn't see much difference, then I start to see that my complexion and uneven skin tone has improved. ETUDE HOUSE Monster Micellar Cleansing Water was mention in my favourite products summer edition and at the time I really like how this cleansing water performs on me, my skin felt soft and clean after each used; but towards the end, I kind of felt like it's just like any other micellar cleansing water you buy from the supermarket, so don't be fooled by its' cute packaging haha. CLINIQUE Clarifying Lotion and the Dramatically Different Moisturising Gel are both stable products in my skincare collection. They have sets for different types of skin and I have always re-purchased the combination to oily ones. The KORRES Black Pine 3D Sculpting Firming & Lifting Night Cream shown in my photo is a sample sized and if I remember it correctly, this came in one those Mecca Loop boxes. I had about two weeks used of this product and I must say that this is a very rich cream and it is probably more suitable for those who has visible signs of wrinkles to see if the firming and lifting really works. MAC COSMETICS Lip Scrubtious Candied Nectar is literally the best lip scrub I have ever tried! It removes dead skin well without being so rough when rubbing the product onto the lips and it's quite moisturising, so it's not a must for me to put lip balms on afterward. LUSH Lip Scrubs Mint Juleps has been a favourite for a long time, it does the job well and the only difference to the MAC Lip Scrubtious is that a lip balm must be used after scrubbing as it is not moisturising at all. I have always loved this product until I tried MAC Lip Scrubtious and then I kind of realised that this is actually a very rough product. Imagine washing your body with soaps and imagine that squeaky clean feeling on your lips. This is my first time trying an It Cosmetics product and I have to say that the IT COSMETICS Confidence In A Cream moisturising impressed me so well! I love this moisturiser, the texture of the cream is buttery, but it doesn't feel heavy on and it makes my skin feels baby soft the next morning. COLOURPOP No Filter Concealer Light Neutral #15 (old numbering / name) has only just started becoming a favourite when I was half way through the tube. Although the texture is quite thick, it doesn't crease, it has a good coverage for covering under-eye circles and it's quite long wearing. TOO FACED Born This Way Natural Radiant Concealer Light was love at first sight and the one shown in the photo is a mini sized that can be purchase from Mecca for around $15?! This concealer is very lightweight with excellent coverage, it's long wearing, it doesn't crease and it smells so good, like coconut. CHOSUNGAH22 Dong Gong Minn Brow Maker Black Brown is a 2-in-1 brow gel, it's a cool concept, but it's very hard to work around with. I only just started liking it towards the finishing when there weren't a lot of product left. When the spoolie is too big and when there is too much products, the product smudges everywhere. MAC COSMETICS Pro Longwear Waterproof Brow Set Brown Ebony has been mentioned once or twice in my previous beauty empties and it's a stable product in my makeup collection. I love that the spoolie is not too big and it sets my brow hair in place all day. BENEFIT Gimme Brow Volumizing Eyebrow Gel is also another favourite and probably the best one I have tried so far. Guys, if you have eyelashes like mine, short, always pointing down that doesn't stay curl for long and literally no mascara works, then you need to try this - HEROINE MAKE Long and Curl Mascara. This has become my number one go-to mascara and it is the only one that keeps my eyelashes stay curl all day. It is sweat-proof and waterproof and I mean VERY WATERPROOF and it's very hard to remove, unless if used with the HEROINE MAKE Mascara Remover (you can buy them in sets). BENEFIT Goof Proof Brow Pencil #3 is a favourite and I am sure I don't need to explain further as everyone love this brow pencil, haha. COLOURPOP Brow Pencil Bangin Brunette is also a favourite, it's very creamy, pigmented and it stays on all day. HOLIKA HOLIKA Wonder Drawing Skinny Eyebrow and INNISFREE Auto Eyebrow Pencil, I don't have much memories of these products, hmmm. I love Charlotte Tilbury but the CHARLOTTE TILBURY Legendary Lashes Mascara doesn't work for me, just as expected. ORIGINAL SOURCE Sweet Apple and Vanilla Milk Shower Gel, this is my favourite shower gel brand, they can be purchased from Countdown (supermarket), they are so affordable and they come in many scents with majority of them smells sweety and fruity. Did you know that the Japanese store next to the cinema on Queen Street, Auckland sells the DAISO Puff Sponge Detergent now and they are only around $3 each, so affordable and does an amazing job at cleaning makeup sponges. BATISTE Dry Shampoo Blush is my favourite dry shampoo brand and my favourite scent is the coconut, but that scent doesn't come in the pocket size. I bought a bunch of ETUDE HOUSE Help My Finger Fast Drying few years ago from the Asian stores in the city, but when I return to buy more non of the stores stock them anymore, tried searching on eBay with no luck, if you know where to buy these please let me know! This product is so amazing, just one to two drops and my nail polish dries without seconds. GUERLAIN La Petite Perfume, not the scent I like, but I kept the tiny bottles as decorations. SOAP & GLORY The Breakfast Scrub *not pictured* has nearly five stars reviews on Mecca, from over 250 reviewers and that means it's a must try and you won't regret it product right?! I really did like it at first, it offers a comfy scrub and left my skin feeling soft, it smells so sweet and wonderful; but as I use it more often, I was sick of the scent, it's like a maple syrup scent that is way too overpowering and the scrub was becoming soggy after being left in the shower. It was such a relief to have finally used up the product and I have reused the container to store my coffee scrubs instead. THE BODY SHOP Tea Tree Skin Clearing Facial Wipes, SOAP & GLORY Off Your Face 3-in-1 Daily Purifying Cloths and 16BRAND Peach Soda Cleansing Tissue *all three not pictured* are my top three go-to makeup wipes. My most used and absolute favourite has to be The Body Shop Tea Tree one as I love the refreshing feeling and scent. 16Brand's Peach Soda smells like an artificial peach, but it's still sweet and Soap & Glory Off Your Face is just average.